Steve, an assistant chief engineer with C&W Services, has worked for the same building in downtown Boston for 41 years. Let that sink in for a moment. Forty-one years. Steve knows every square inch of the 1.2 MSF Class A office building he services and understands the history of every upgrade and improvement. Facilities management, and specifically maintenance and engineering, isn’t just Steve’s day-to-day job—it’s also his lifelong passion. From a young age, Steve began helping his parents with maintenance tasks around the house, teaching himself about repair work by trial and error. Steve brings a great work ethic to his craft and a deep, specific set of skills and knowledge that ensure his nearly 40-story building runs like a tight ship. Before starting his career with C&W Services, Steve was part of the Coast Guard, where he learned the importance of multiple backups for every mechanical system and that a team can fix most problems in a self-sufficient way. Steve transitioned those technical skills to keep one of Boston’s marquee properties operating efficiently and safely, all day every day. Always be on the look-out for improvements. Steve has executed mechanical retrofits that keep his building current with new technologies and produce considerable cost and energy savings for his client. For example, he spearheaded a project that puts modern controls on six enormous fans, which means they now run their part of the building’s systems with 50 percent less power. If that is not proof of Steve’s deep value to C&W Services and his client, he rebuilt a cooling tower for $50,000 less than a vendor proposed to do the same assignment. He also reinsulated piping, resulting in a savings of $85,000. Beyond the stats and numbers, he brings a fun personality and a great sense of humor to keep his team smiling as they work through the day. 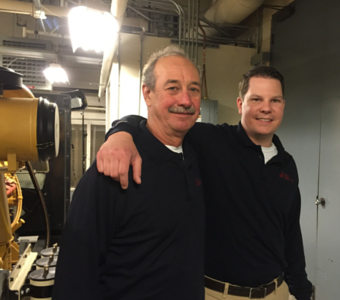 His maintenance team is a tight group, largely due to Steve’s gregarious and warm spirit. Finding a sign of happiness in the workplace. Steve enjoys working for C&W Services. He is proud to use his skills to be part of our team. He loves the benefits and holds the same values as the leadership team. However, the biggest endorsement he has given us is encouraging his son Dan to work for our team. Dan manages a suite of four buildings about 20 minutes away and merges his skill set with his leadership talent to foster an amazing career with C&W Services—just like his father. C&W Services” reputation rests on the hard work that employees like Steve deliver. He is one of many long-time, dedicated employees who know and love the buildings they serve. Team members like Steve are a keystone to who we are as a company. Steve is one of many stories we have from the field that demonstrate how our team’s culture is the backbone of our service delivery success.